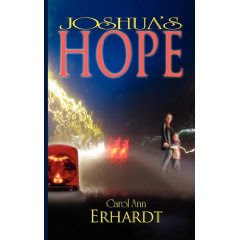 Joshua's Hope by Carol Ann Erhardt is a great book to take along for a day at the beach or a long airplane ride. It's an engaging page-turner about a woman, Hope Courtland, who struggles to rescue her stepson, four-year-old Joshua, from his father who she divorced. Erhardt takes you to edge-of-your-seat suspense when Hope becomes a suspect in the murder of her ex-husband. Zack Stone, sheriff of Pine Cove where Hope lives, is instrumental in helping her restore her faith in God and trust Him with Joshua's future and her own as he becomes an important part of her life. Thanks, Karen, for reviewing my book. I'm so glad you enjoyed it. My heart warms whenever I hear people give the "tissue alert" because I know I've touched hearts.